Takachiho Shrine is one of the most important shrines in the area, as it serves as the representative shrine of all eighty-eight shrines in the eighteen neighborhoods of the Takachiho area. It is said to date back over 1,900 years. 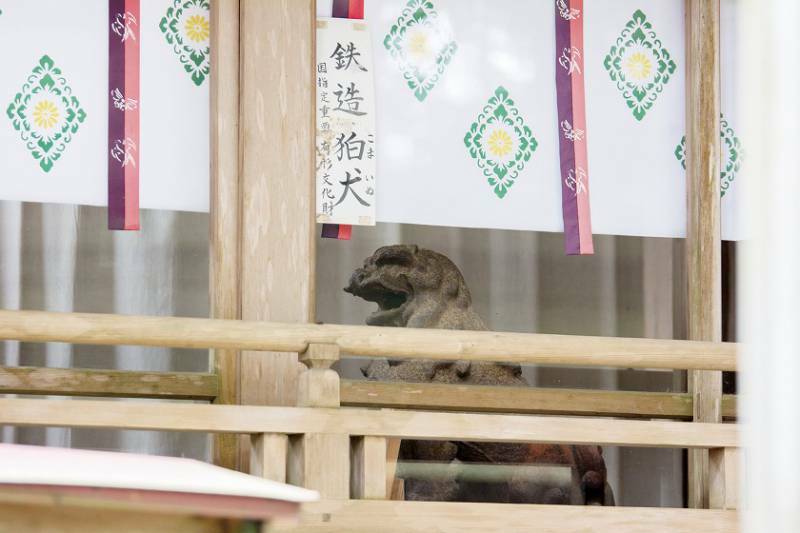 The first three mythological generations of Japan’s imperial line are honored at Takachiho Shrine. This includes the kami deity Ninigi no Mikoto, the first ruler of the earth and grandson of the sun kami deity Amaterasu. 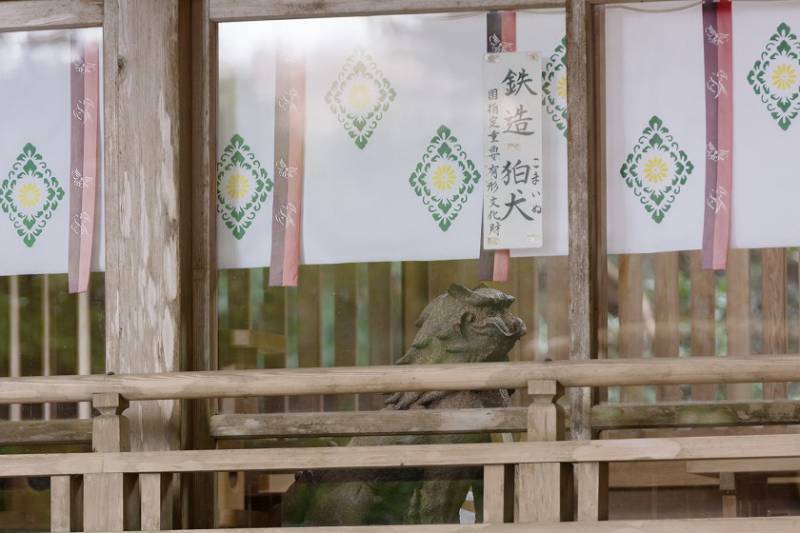 The shrine reveres Mikeiri no Mikoto, a direct descendant of Ninigi and an older brother of Japan’s first emperor. 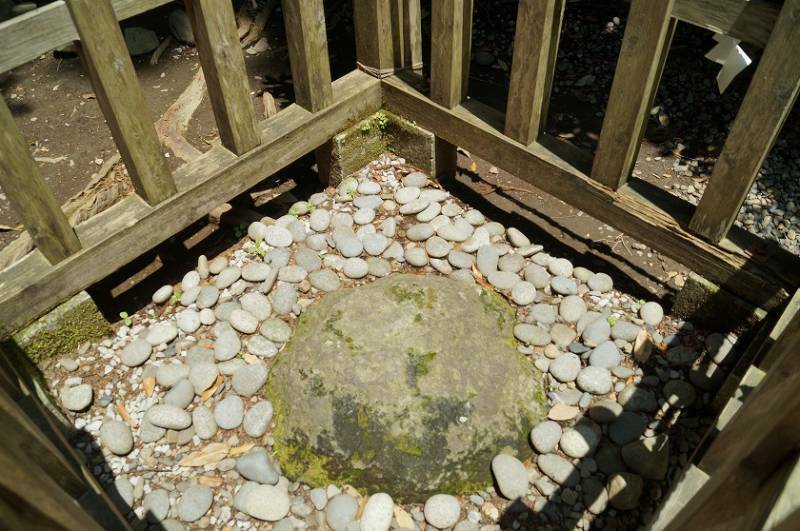 Mikeiri is considered locally to be the first governor of Takachiho. In local legend, he saved the inhabitants of the area by defeating the fearsome kami deity Kihachi who terrorized them. Mikeiri has thus long been thought to ward off misfortune. The existing Main Sanctuary of Takachiho Shrine was rebuilt in 1778. 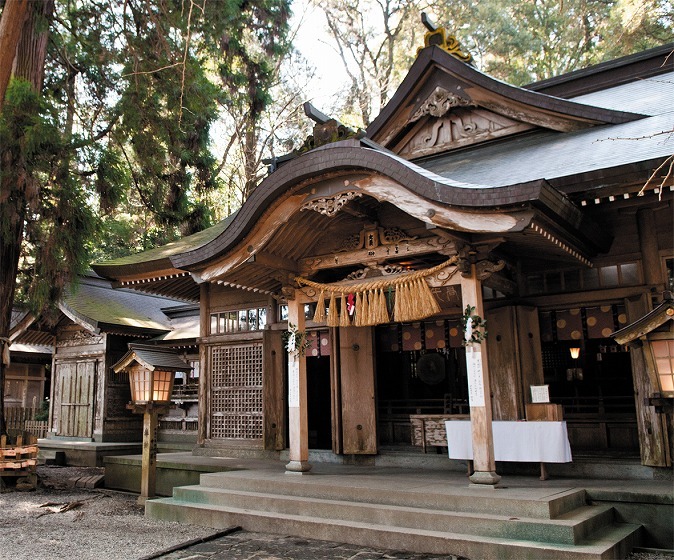 It was made in an architectural style for shrines characterized by a five-bay sanctuary (gokenshazukuri). This is one of the largest examples of this construction style in the Kyushu region. The Main Sanctuary was nationally recognized as an Important Cultural Property in 2004. On the right-side wall of the Main Sanctuary, there is a carving said to depict the local legend of Mikeiri no Mikoto, the older brother to Japan’s first mythological emperor, destroying the fearsome kami deity Kihachi. According to the legend, Mikeiri returned to his hometown of Takachiho to live and govern after his younger brother became emperor. There, he vanquished the tyrant Kihachi who had been terrorizing the people of the village. He did so by cutting him into three pieces and burying them in separate locations in the area. He also rescued Princess Unome from Kihachi and married her. Together, they had eight children. In the Takachiho area, Mikeiri is associated with defeating malevolent kami deities that harass the mountain farming villages, and so considered a patron of industry and a divine protector against misfortune. 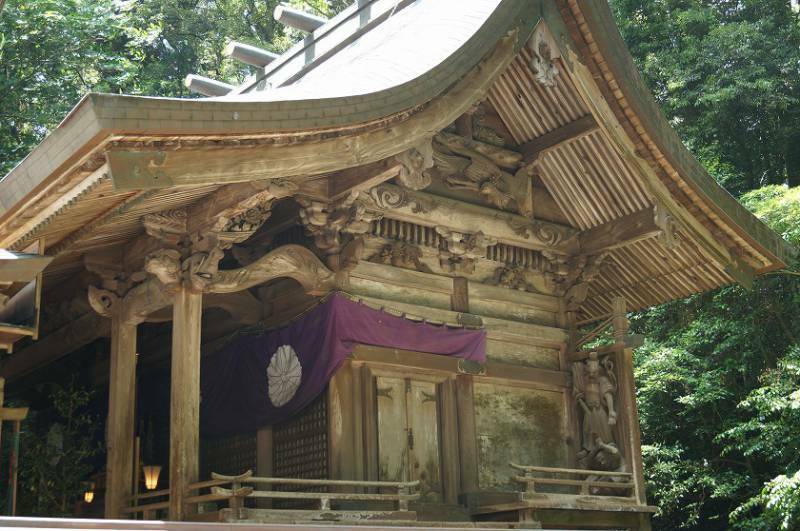 Mikeiri, his legend, and his family are all honored at Takachiho Shrine. These two cedars grow from intertwined roots, representing mutual dedication similar to that of a married couple. 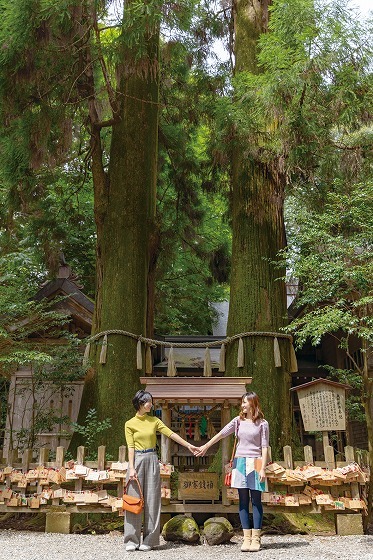 Local belief says that visitors who circle the trees three times hand in hand with someone they love will both be blessed with a harmonious relationship, a peaceful home, and a wealth of children. The task of walking around the trees should not be taken lightly, however, as they are surrounded by gnarled roots. It is said that people who stumble will receive no blessings at all. This massive tree stands at 55 meters tall with a 9-meter circumference and is well over eight hundred years old. It is said that the Chichibu Cedar was planted by the famous warrior Hatakeyama Shigetada (1164–1205) when he was sent by the first shogun of Japan, Minamoto no Yoritomo (1147–1199), to pray for nationwide peace and tranquility at Takachiho Shrine. At the time, Shigetada planted two trees, but only this one remains. The second tree was felled by a typhoon in 1992, and the funds from selling it as raw material were used to build the new Kagura Hall. 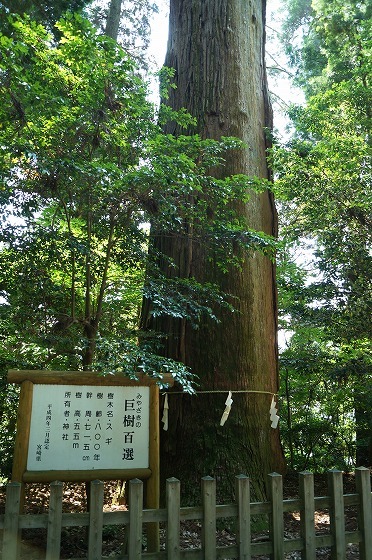 The name of the remaining tree, “Chichibu Cedar,” is believed to derive from the name of Shigetada’s hometown, Chichibu. These precious ironwork guardian dogs were dedicated to the Takachiho Shrine by the first shogun of Japan, Minamoto no Yoritomo (1147–1199), during the Kamakura period (1185–1333). They were designated as a National Important Cultural Property in 1971 due to their age and cultural value. 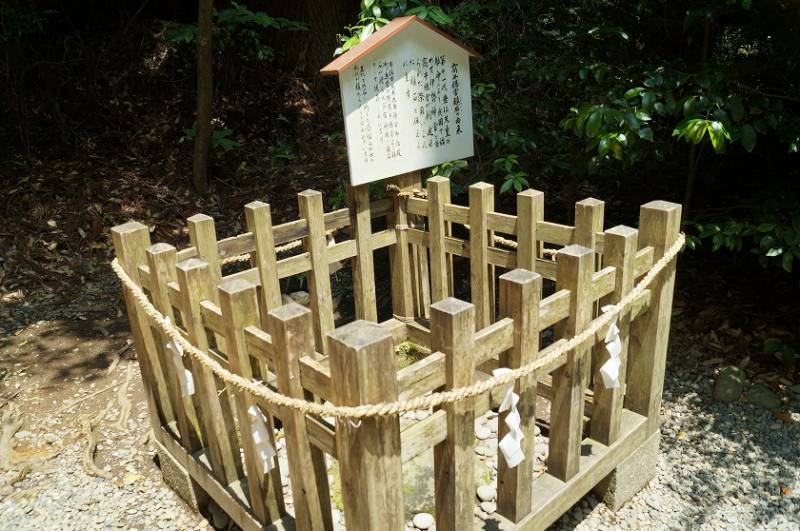 Originally, the dogs sat on either side of the shrine’s entrance to protect against malevolent spirits. Today it is a key element of the shrine grounds, and has become a site for praying to ease one’s worries and find peace. Some say that spiritual energy can be felt emanating from it. Click here for accommodation information. © 2019 Takachiho Tourist Association.